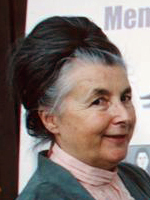 Simone Liebster (née Arnold) was born in August 1930 in a small Alsatian village. At age three, she moved to the bustling city of Mulhouse with her parents, Adolphe and Emma, and her dog Zita. From an early age, Simone, like her parents, was deeply religious and had a strongly developed sense of justice. Though her father provided well for her family, Simone felt incensed by the inequities she saw around her, especially during Christmas, when even the Christchild seemed to differentiate between rich and poor. Adolphe and Emma raised Simone to listen to her conscience, even if it meant being different from or unpopular with others. When Simone’s mother, Emma, began reading the literature of the Bible Students (Bibelforscher, also called Jehovah’s Witnesses), Simone’s father forbade Emma to talk about her new beliefs with her insatiably curious girl, but eventually all three were baptized as Jehovah's Witnesses. In the meantime, Hitler’s armies were marching across Europe, bringing with them oppression and violence. Simone’s home region of Alsace became a special target of the Nazi “Heim ins’ Reich” program, to make the contested land “German” again. Because of their faith and their refusal to conform, Simone and her parents faced threats and coercion. Simone’s father, Adolphe, was the first arrested, along with other male Jehovah’s Witnesses. Nevertheless, Simone, then age 11, was determined to listen to the voice of her conscience. She refused to give the Hitler salute or sing Nazi songs, acts that she felt amounted to worship of a man. After several patriotic teachers confronted, ridiculed, expelled, and even knocked her unconscious, Simone was arrested by juvenile authorities, taken to Germany, and put in a Nazi penitentiary home. For nearly two years, Simone was forbidden to talk and was forced to do hard labor. Both her parents by this time had been imprisoned in Nazi camps, and none expected to live to see the family reunited. The end of the war arrived, though, and the Arnolds all returned home and rebuilt their lives. Simone attended art school, like her father. Then, after learning English, she went to the United States to the Watchtower Bible School of Gilead. In 1956 Simone married Max Liebster, and together they have devoted their lives to their ministry and to peace education.